The perfect sidekick! 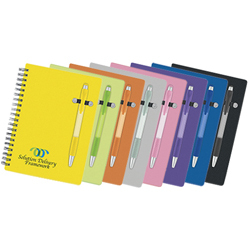 With 70 pages, your choice of eight bright translucent covers and a colorful matching pen, our Pen-Buddy Notebook is a great companion for your busy clients or employees. Plus, you can save almost 50% until September 30, 2011! Don't miss out - contact your sales representative or contact us today, because this is the one time you can buy your friends.